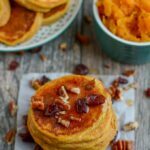 This Butternut Squash Pancakes recipe is an easy way to add some extra vegetables to breakfast! Made with just a few ingredients, they can be made ahead of time and reheated and also make a great, healthy snack! Option 1: Add all ingredients to a blender and blend until smooth. Option 2: Combine squash, eggs and vanilla in a small bowl and mix well. Add baking powder, cinnamon and flour and stir until just combined. Scoop onto a greased griddle or pan. Flip when bubbly. You don’t need a blender for these but it definitely makes a smoother batter. If you’re not using a blender, be sure your squash is very well roasted and soft and mash well before starting! I found that smaller pancakes work much better than larger ones for this recipe.